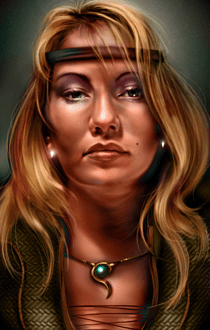 This is the author’s home page for the BG2 mod, “The Perils of Branwen”. I think I started it in 2003. Two people have made translations for which I am grateful. I have no plans to enhance or finish the mod. If anyone else wants to develop using it, then fine. (It might even be useful as a template.) This page documents the context, gives you a hint as to where you’ll find her and talks about the playability and characterisation. See the Download Page for the mod files and downloads. I now have a Perils of Branwen forum at rpgdungeon.net, which is not very active. I started to write a game mod for Baldur’s Gate 2, your favourite cleric, Branwen returns to Ankathla. She’s followed you from Baldur’s Gate. The neutral good cleric of Tempus can be found in the Bridge district. What happened to Branwen, did you rescue her from the flesh to stone spell, did you travel with her to Baldur’s Gate and confront Saverok? The young barbarian cleric from the North returns, but to help or hinder? She is currently at version 0.8.5D. 0.9. She’ll join your party, but best not let her leave. In future, she’ll be a true Cleric of Tempus and be more chatty. This release is ready to play, but with little no characterisation although it makes use of the BG1 sound files. This ‘mod’ for Baldur’s Gate is weidu compliant. I’m releasing this in its current unfinished state because it is playable, if you role play well, she’s as interactive as the BG1 character and I want to put something playable in front of people. I’d say my plans are based on a “Release early and release often” approach, but I know the first ain’t true and I have severe doubts about the second. At V0.8.5D, you’ll find her in the Bridge district. She’s at 80,000 XP and thus 7th level. She is reasonably equipped and has developed her innate abilities. If you remove her from the party, she can be found inside the Temple of Helm in the bridge district. (I expect that she’ll be back at the same XP as when you first meet her). Apart from her joining and leaving conversations, this version has no banters, interjections or quests. She is unkitted i.e. she is a true class cleric. The mod does use the the bioware (english) sound tracks. There is a companion page on this wiki which hosts the software downloads. This should be used in preference to the old micro site. This page was copied from the Perils of Branwen at http://www.davelevy.info. There is also a download page hosting the mod downloads at http://www.davelevy.info. This has been mirrored here at Perils of Branwen (Mod). The page was moved to this site, and minor modifications made. I posted the Russian Translation at rpgdungeon.net, Full credits as far as I can, were posted in a thread called “Russian Translation”, together with an apology for taking so long to post it. This has now gone. I have been written to by Leomar, who has upgraded my module and undertaken a German translation, available on my Download pages. He also pointed out that an rpgdungeon.net corespondent, woundedlion has also created a Branwen mod for BG2. This like mine has not been updated for a while and seems to have gone away with rpgdungeon. I reorganised the page(s), added the comments to this page, and since I moved to the Nulis theme, I made an image to act as the article featured image, which is only visible on multi-entry pages. If you want to see it, click here…. Over the summer and autumn of 2014, rpgdungeons went offline. This makes these wiki resources more important, I have made some small changes to bring this page and its companion download page up to date. I propose to offer/include a clerical kit, banters & interjections and a quest at coming version releases, although I haven’t decided in the order I’ll do these thing; I also need to implement a fix for the problem in retaining XP (& Kit) should she leave the party. The current structure is not ready for multi-language support and I do propose to implement this. I have an automatic installer for windows and hopefully someone’ll help me create a Mac version. The various detritus from the development process also needs to be removed. 1and1 changed their default 404 handling at some point in recent history, this required me to make some changes to the .htaccess file. The original page i.e. the source for this page and the downloads remain in the original folder structures and bookmarks from the noughties should still work. Navigation within what is now a micro site should still work. I made minor changes to the text of the article to encourage people to stay on the wiki. I have amended the page to finally remove the broken links to rpgdungeon.